Japan Sake KitKats on the right and the new release, Ume Sake KitKats, officially called “Umeshu Tsuru-Ume KitKats“, on the left. Earlier this year, Nestlé Japan announced they would be releasing another sake-based KitKat to their range, this time featuring the flavor of umeshu, traditional Japanese plum liquer. Following the huge success of their previous premium sake KitKat release, created in conjunction with an esteemed brewery from Toyama Prefecture and former Japanese soccer star Hidetoshi Nakata, Nestlé brought Nakata back on board for their latest release, and this time Wakayama-based Heiwa Shuzou is providing sake-based plum-flavored alcohol for the collaboration. 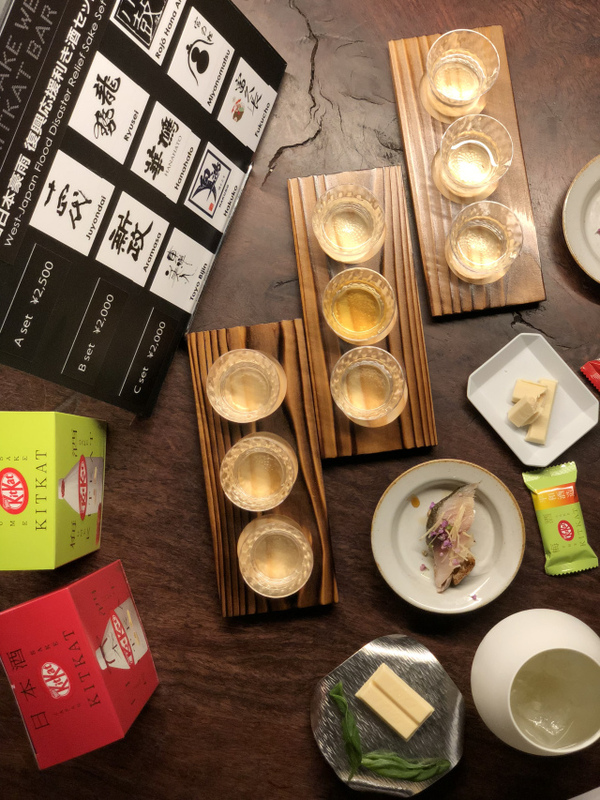 The new Ume Sake KitKats are scheduled to be released nationwide from Tuesday, but for a limited time you can get your hands on one before the rest of the country does, at a special pop-up bar called Craft Sake Week @KitKat Bar. 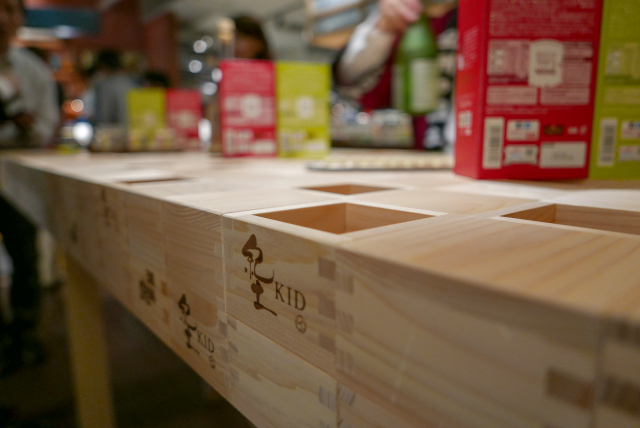 Located at CITAN, a cafe-bar-hostel in Tokyo’s Nihonbashi neighborhood, the pop-up bar has a host of impressive features to honor the new KitKat and its star alcoholic ingredient. And overseeing everything in the space is former soccer superstar Nakata, who’s now a sake superstar using his wealth of experience with over 350 local sake breweries to help design products that promote the beauty of Japanese rice wine throughout Japan and the rest of the world. ▼ Nakata (left) worked together with Heiwa Shuzou’s CEO, Fumio Yamamoto, (right) to select the brewery’s best plum sake for the new KitKat. 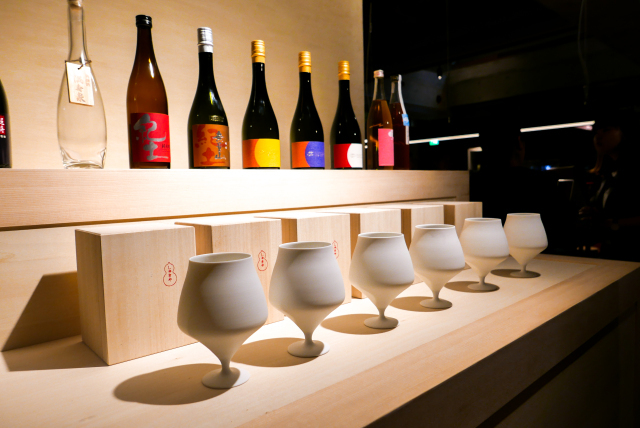 First, up, there are a limited number of beautiful Milano sake glasses on sale, which have been produced by esteemed ceramicist Kyosuke Hayashi in collaboration with Nakata, using a design that enhances the taste and fragrance of sake while conveying the beauty of traditional Japanese crafts. 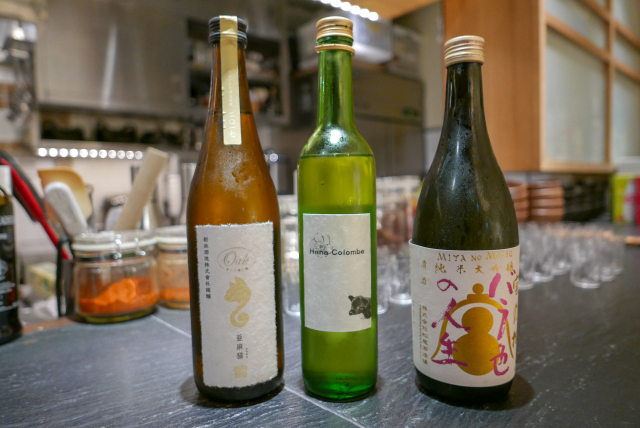 There’s also a gorgeous sake-tasting area, where customers can enjoy a selection of four kinds of umeshu and 12 sakes from around Japan, all chosen by Nakata, with a different brewery representative on hand each day to help you with your selection. 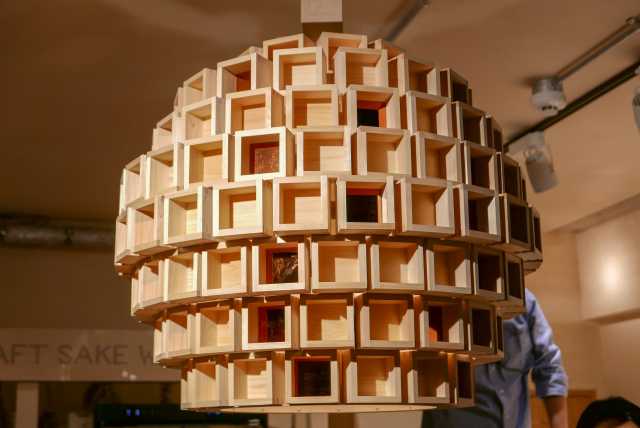 Both the bar counter and the lamp here are made with layers of wooden boxes, or masu, which are traditionally used for measuring rice and sake, and sometimes used as sake drinking vessels. 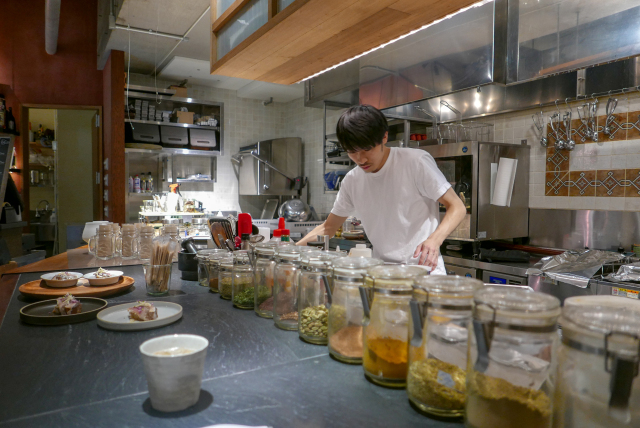 The space also has a kitchen area, which serves up a number of delicious meals, but for this pop-up bar experience they’re serving an insanely delicious Cured Mackerel and Tofu Sour Cream Tartine for 500 yen. This menu item has been created exclusively for the KitKat pop-up bar by Shinobu Namae, Executive Chef at Tokyo’s L’Effervescence, a French restaurant which has been awarded two Michelin stars every year since 2015. 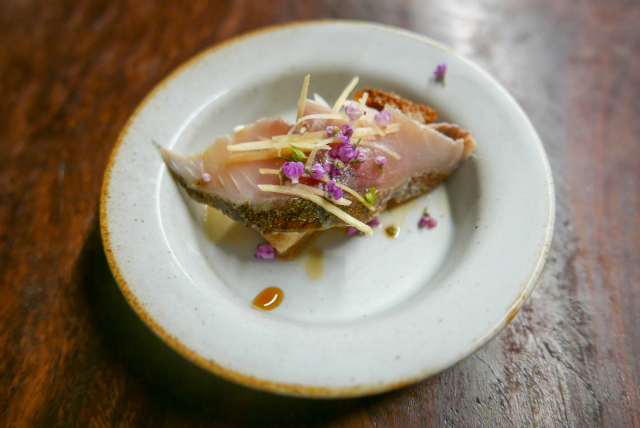 The sourdough and tofu sour cream base have a beautiful acidity that pairs wonderfully with sake, and the cured mackerel topping makes it taste as if you’re eating sushi, only with sourdough instead of rice. It’s pure perfection, and mouthwateringly delicious both with and without alcohol on the side. 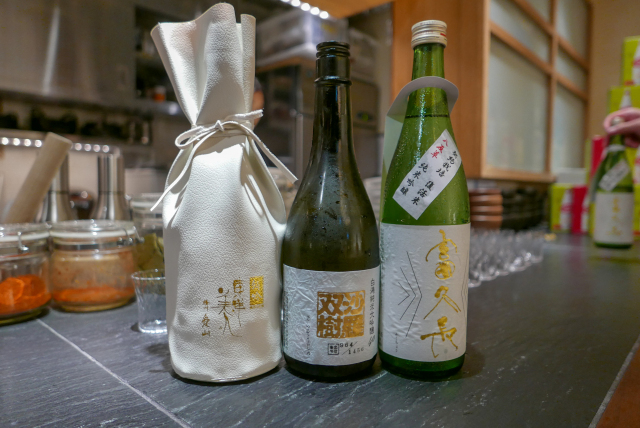 What’s really enticing people to the pop-up bar, though, is the drinks menu, which includes three different “West Japan Flood Disaster Relief Sake Sets” to help support people and businesses in flood-stricken areas. The A Set contains: Juyondai Junmai Daiginjo “Cho Tokusen” (Super Premium Selection)from Yamagata’s Takagi Brewery, Ryusei Special Junmai Daiginjo Kimoto from Hiroshima’s Fujii Shuzo, and Junmai Daiginjo “Rojo Hana Ari Peach Blossom from Hyogo’s Nishiyama Brewing. The B Set contains: Aramasa Amaneko Oak Aged 2016 from Akita’s Aramasa Shuzo, Hanahato Kijoshu from Hiroshima’s Enoki Shuzo, and Miyanomatsu Junmai Daiginjo 37 “La Vie En Rose” from Saga’s Matsuo Shuzojo. The C Set contains: Toyo Bijin Tokugin (Special Selection) Junmai Daiginjo Banshu Aiyama from Yamaguchi’s Sumikawa Brewery, Hakuko Junmai Daiginjo 40 “Sarasoju” (Sal Tree) from Hiroshima’s Marikawa Shuzo, and Fukucho Junmai Ginjo Hattanso from Hiroshima’s Imada Brewery. 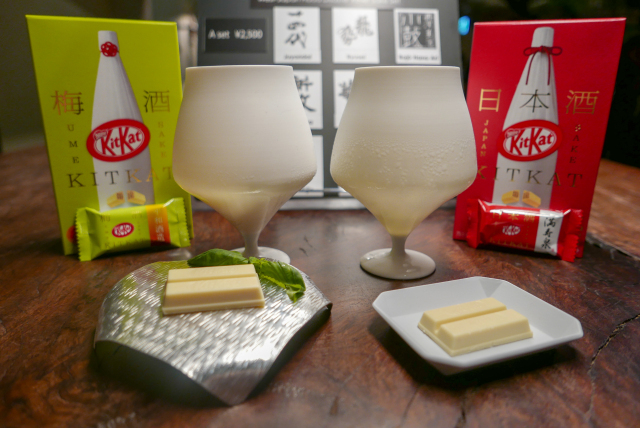 But the real highlight of the limited-time bar is the two Kit Kat and cocktail pairings, which are served in the gorgeous Milano glasses. The cocktails have been specially designed to complement the flavors of the new Ume Sake KitKat, and can only be tasted at this bar. 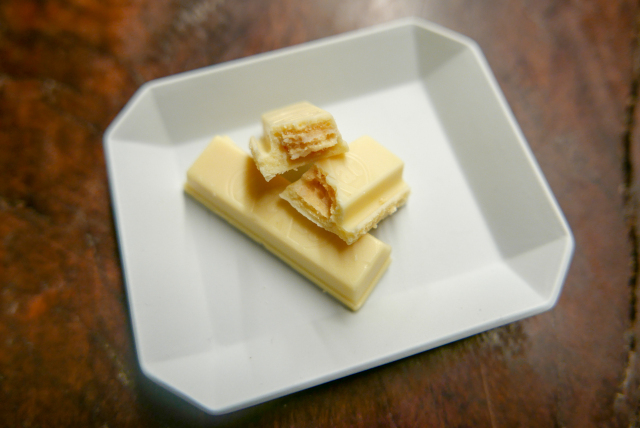 Created by Rogerio Igarashi Vaz, a bartender at Ebisu’s Bar Trench, which was voted the 16th best bar in Asia at the Asia’s 50 Best Bars Competition 2018, this KitKat/cocktail pairing is being called a world-first for the well-known chocolate brand. The first cocktail on offer is the Kishu Tonic (1,000 yen), made using KID junmai ginjoshu from Heiwa Shuzou brewery, along with basil and cucumber vinegar. Basil is said to pair beautifully with plums, and they’re definitely right — nibbling on the basil while nibbling on the plum alcohol-infused KitKat creates a brilliant flavor combination, with the tart notes playing off each other brilliantly. What’s most surprising, though, is the absolute brilliance of the cocktail, which was the lightest, most refreshing summer beverage we’d ever tasted. Perfectly smooth, the basil and cucumber vinegar blend was the star here, rounding itself out with just a hint of sake in its aftertaste, to remind us that this was indeed an alcoholic cocktail, despite its easy drinkability. The second cocktail is the Suppai Colada (1,200 yen), which is made with Heiwa Shuzo’s Tsuru-ume Suppai Umeshu, a plum liqueur made with a sake base, which is the key ingredient for the new Ume Sake KitKat. The plum wine is mixed with white cacao liquer and a yuzu citrus sherbert in a blender and then served up with a rose garnish topping. This has a much creamier and more intense, sharp flavor than the first cocktail, and despite being entirely different in texture and taste, it still complemented the flavors of the new KitKat superbly. 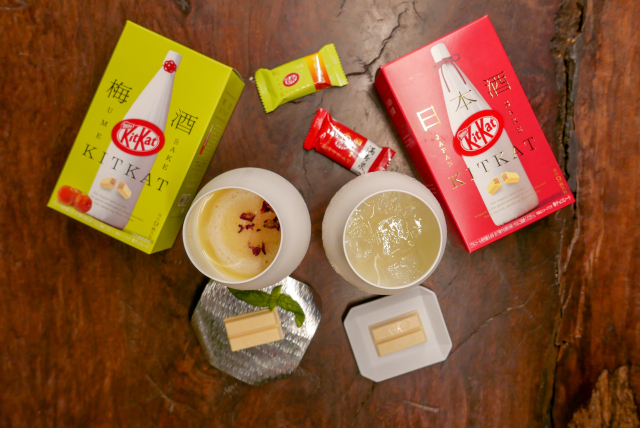 Suppai means “sour” in Japanese, and this KitKat/cocktail pairing certainly celebrates that element, but with a well-rounded balance of flavors. 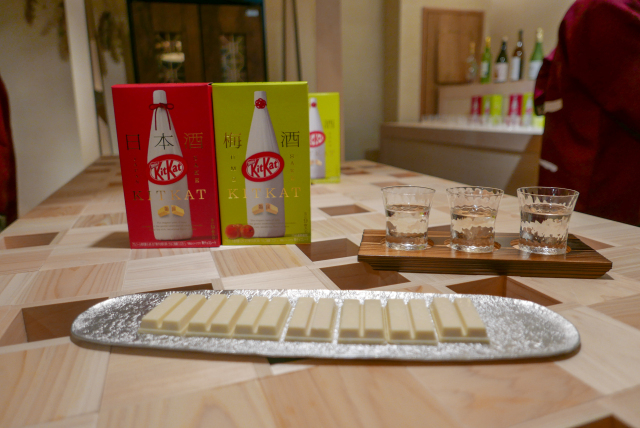 And at the center of the Craft Sake celebration at Citan is the new Umeshu Tsuru-Ume KitKat. 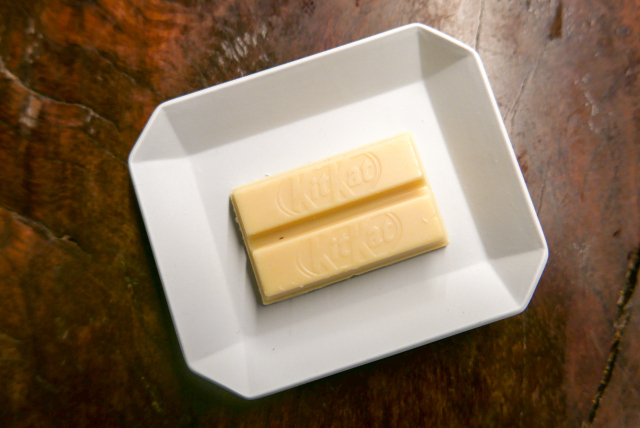 It might look like an ordinary KitKat, but a lot of premium ingredients and expert tailoring has gone into its creation. The umeshu used in these KitKats is unique in that it’s made from Heiwa Shuzo’s “Tsuru-ume Suppai Umeshu“, a plum liqueur that’s made with a sake base instead of the usual distilled alcohol base. This special umeshu is also made with Nanko plums from Wakayama Prefecture, which are widely considered to be the best on the market, due to their soft pulp and extremely rich flavor. These KitKats pack as much alcohol into each bite as they do flavor, which is to be expected, given that each serving contains 0.2-percent alcohol, with a warning on the box that they shouldn’t be eaten by children or alcohol-intolerant adults. The first thing you notice as you bring these to your mouth is the beautiful aroma of plum wine. When you take your first bite, the plum aroma intensifies as the white chocolate melts on your tongue, and then there’s a surprising hit of slight saltiness reminiscent of pickled plums. As you bite into the wafer, the taste journey intensifies, with the distinct flavor of tart plums revealing itself, before swinging tantalisingly back and forth between alcoholic plum, sweet plum, and salty tart plum notes, finally giving way to a pleasant sweet plum finish. These are undeniably well-crafted, and we’d go so far as to say they’re one of the best KitKats we’ve ever tasted. While many KitKat releases can be overly sweet, this variety explores a more mature flavor profile, focussing more on the tart and sour notes that appeal to alcohol drinkers, particularly lovers of umeshu liqueur. 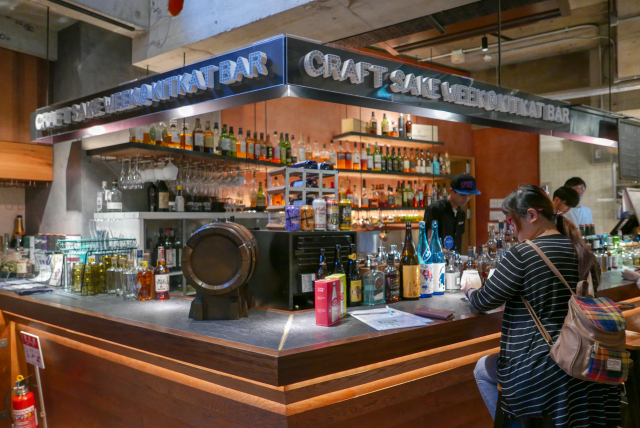 In fact, everything at the limited-time Craft Sake Week @KitKat Bar has been meticulously chosen and lovingly created, with a focus on quality and high-end Japanese flourishes. 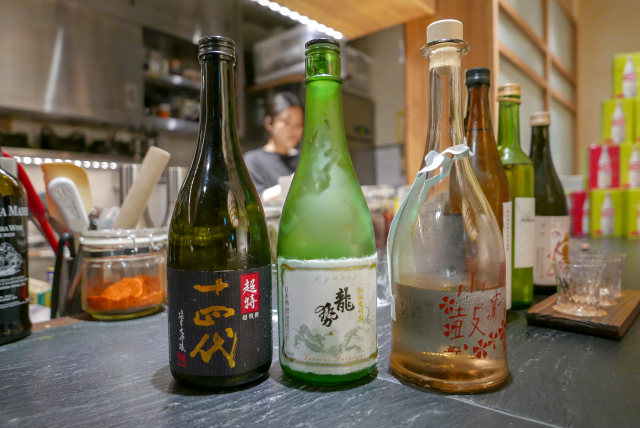 From the specially selected sake to the carefully thought-out cocktails and the sourdough sushi from a two-star Michellin restaurant, it’s definitely worth stopping by for a visit — especially given that you won’t be able to try these special offerings anywhere else. 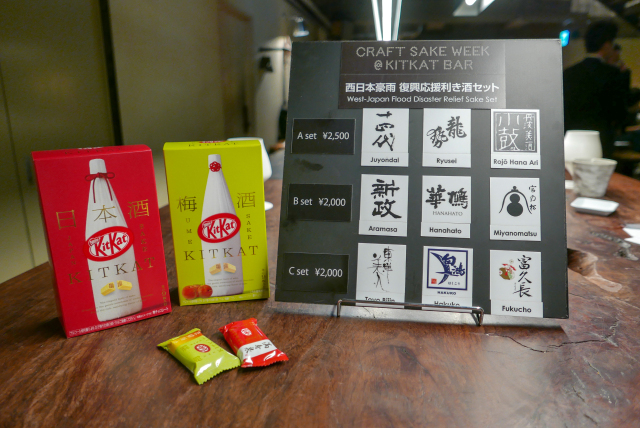 The Craft Sake Week @KitKat Bar runs until Sept 24, while the new Ume Sake KitKats go on sale around the country from Tuesday, sold in a nine-pack box that retails for 700 yen. Wow. Some folks take eating Kit-Kats to a completely different level.